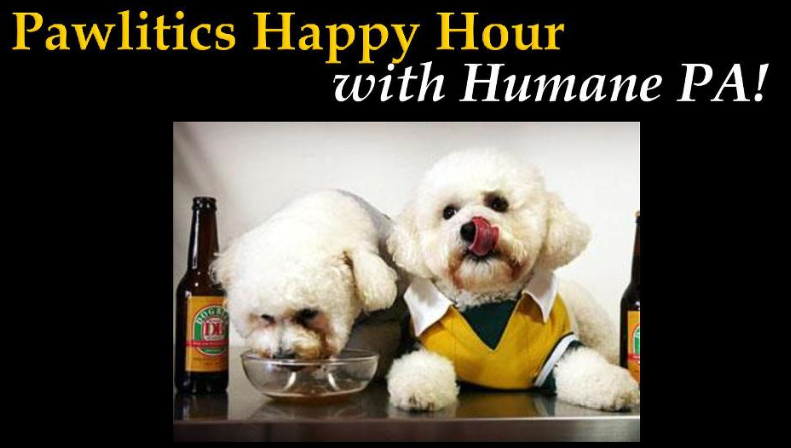 Humane PA | Organizing a Party for Pawlitics Happy Hour – the Humane PA way! You are here: Home » Take Action » Organizing a Party for Pawlitics Happy Hour – the Humane PA way! Organizing a Party for Pawlitics Happy Hour – the Humane PA way! Happy Hours have proven to be very effective ways to not only raise funds for a great cause, but also to meet like-minded advocates, host your local legislators to speak to your group, raise local awareness of the animal vote and to have fun! Hosting a Happy Hour can be simple or complex – the choice is entirely yours. Some hosts keep it very simple and only make arrangements with an area bar and invite guests. Other hosts prefer to have raffles, prizes, and more elaborate food. Pick the format with which you are most comfortable and you are assured a successful event! 1. Contact Humane PA to let us know you are interested in hosting an event. Humane PA volunteers will help advise you and will help promote the event. 2. Find a location to hold the happy hour and make the arrangements for a time and date. It is helpful if you have a local restaurant or bar you are familiar with and even better if you know people who work there. Many bars donate cause fundraising events, so don’t be afraid to ask. It is a win-win for the bar, because they get additional business all while helping a cause they hopefully believe in and can feel good about. If you are successful in bringing in a lot of business, the manager will likely be more interested in working with you again. It pays to negotiate for as much to be donated as possible. There are two options for happy hours – A. Your guests make a donation—say, $10/15 in advance and $15/20 at the door. B. No advance charge, but a set percentage of the drinks/food sold that evening to be donated to your cause. 3. Invite speakers. We recommend no more than 2 speakers who talk for about 10 minutes apiece. Humane PA can recommend humane legislators in your area and help you contact them. Constituents enjoy hearing from them about how they can make a difference for animals and the legislators appreciate the ability to talk to friendly constituents who are happy with their record. You can also contact Humane PA, who may be able to provide a speaker. 4. Advertise the Happy Hour. Humane PA will create a Facebook event page, advertise it on its Facebook page and other social media to help promote the event. Get the word out! Use email and social networking to invite as many people as possible to the Happy Hour event. You can also ask local animal advocates and groups to help you promote your Happy Hour or post flyers in animal friendly businesses. 5. Recruit volunteers. Happy Hours in bars are generally easy because they have the staff that bartends, servers who take care of the food and make sure the guests are taken care of. It is helpful to have someone staff a table at the entrance to collect donations, make sure guests sign in and to greet them. It is also helpful to have a few friends and volunteers circulating to make sure everything runs smoothly and everyone is having a good time. 6. Get items donated to raffle. You can also contact local businesses that you think might be interested in supporting Humane PA. While some business leaders may make cash contributions, others may be willing to provide gifts-in-kind such as food, equipment, prizes, gifts or space in exchange for the publicity the event will bring them. Donated items can help keep down the cost of running the event. 7. Recruit Humane PA members and more advocates for animals. Be sure to get addresses and emails for attendees so they can be a part of the Humane PA network. Encourage them to join Humane PA on Facebook and get active.